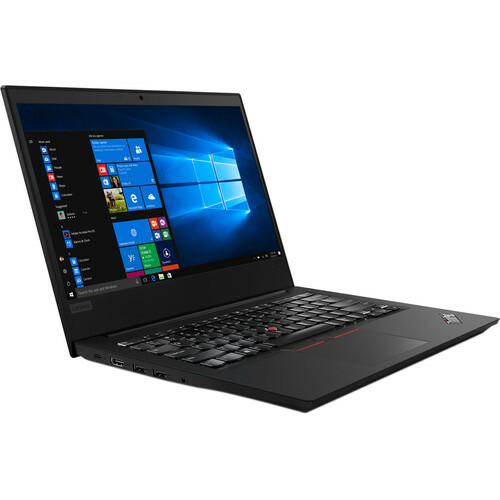 Stay productive with the Lenovo 14" ThinkPad E485 Notebook. The 14" display has a HD 1366 x 768 resolution, a 16:9 aspect ratio, and wide viewing angles. Visuals are handled by integrated AMD Radeon Vega 8 graphics. You can also output to an external display via the HDMI port. The system is powered by a 2.0 GHz AMD Ryzen 5 2500U Quad-Core processor. It also has 8GB of 2400 MHz DDR4 RAM, a 500GB 7200 rpm HDD, a microSD media card reader, Wi-Fi 5 (802.11ac), Bluetooth 4.1, USB 3.1 Gen 2 Type-C, and USB 3.1 Gen 1 Type-A ports. The notebook features an AMD Ryzen 5 2500U processor. Its dual cores can reach a base clock speed of 2.0 GHz and can be boosted up to 3.6 GHz. The 14" display features a HD 1366 x 768 screen resolution and a 16:9 aspect ratio. The screen also features a matte finish to reduce glare.